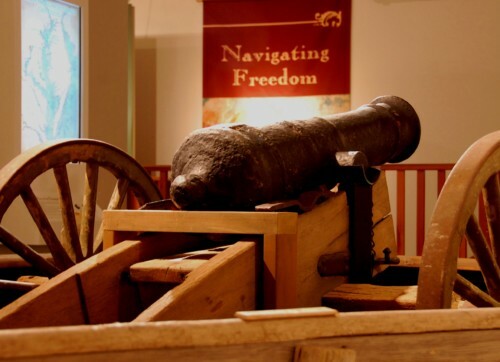 A new major exhibit entitled “Navigating Freedom: The War of 1812 on the Chesapeake” opened May 11 at the Chesapeake Bay Maritime Museum (CBMM) in St. Michaels, MD. This exhibit explores the impact of the War of 1812 on the people of the Chesapeake­­––black and white Americans, militiamen, Baltimore merchants, and British sailors—who found opportunity or misfortune amid the conflict. Their diaries, artifacts, portraits, and articles reveal their personal stories, and the ways the War of 1812 on the Chesapeake challenged American ideas about freedom. The exhibit also has several interactive components. CBMM partnered with Washington College’s GIS lab to generate a 3D virtual flyover of the Battle of St. Michaels, as well as maps highlighting the cultural landscapes of the area. Additional stories, research, and activities will be shared with the public beyond CBMM’s campus through an interactive online exhibit, curriculum materials, teacher workshops, and a series of public programs for all ages. This special exhibit runs through 2015 and is free for CBMM members or with museum admission. For more information, call 410-745-2916 or visit www.cbmm.org.